Posted in Zoos need to go! Another senseless death at a zoo of an innocent animal. The leader of the troop at the Cincinnati gorilla enclosure is dead. Harambe shot dead for protecting a child. Look at this article and the videos. By all eye-witness accounts this happened because the mother was not attending to her child. 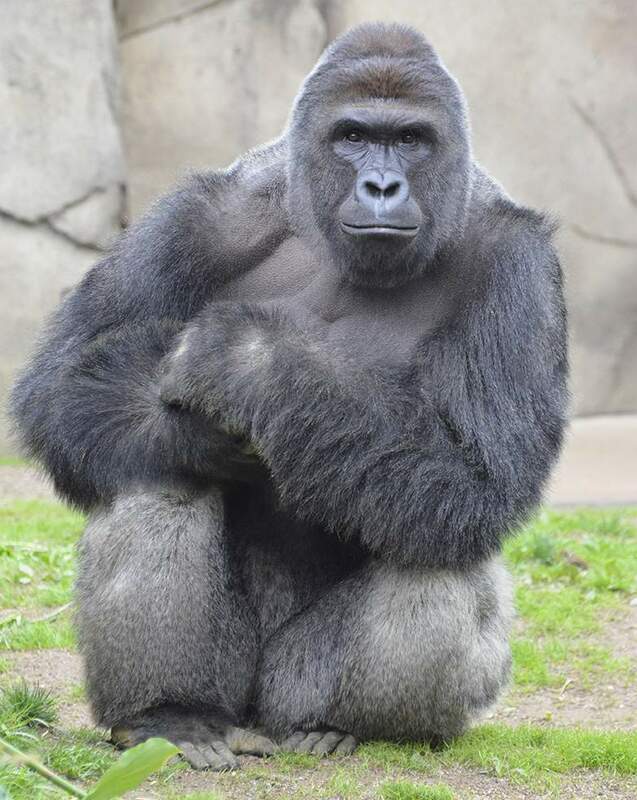 This magnificent gorilla did not deserve to die. Just last week two lions were also shot dead due to the illogical actions of a mentally deranged man in a Chilean zoo. I think zoos are a thing of the past. Let us have sanctuaries like my friend’s in the Tampa area. Let us bring our children and grandchildren to places that harbor and protect all animals. Let them interact, not gawk! I digress. I need to put my feelings about poor Harambe into words. First we need to discuss the mother. I want everyone to know I do not JUDGE others, but where was she? I see videos online of her child in the enclosure with Harambe. Then I find out her profession is child care. If this had happened to my child I would have crossed fences, nets, everything to get to my child. I hear her say “Mommy loves you.” It seemed phony, not what I would have done…I would have hopped over that damn fence and dropped in even if I broke something. Where was Mommy while child entered this area after repeating to anyone who could hear “I want to go in that water?” It makes one ponder for just a moment this world of social media we live in. Is it possible this was the greatest scam ever? I have not seen any eye-witness say anything other than the child kept repeating he wanted to get in the water. Now, if we heard our grandchild or child say this, especially at the age of three, we would either pick them up or put them in a stroller. It is simple. End of this part. I don’t have facts, just opinions. My opinion is that the mother was negligent. Harambe described by many as a gentle giant who visit this zoo. He was the leader of the troop of gorillas and now they are all grieving for him. We can watch the many videos of Harambe pulling this child through the moat and react with horror, or we can think about how we would react if we saw a child drowning or hurt in the water. Harambe was reacting to an emergency, the way a gorilla would with his troop. The injuries at first reported as grave, serious and more. In actuality they were a concussion and some scrapes, the concussion most likely from the fall the scrapes from Harambe pulling him away from the moat. He then stood protectively over the child. It is obvious from the many observations from eye witnesses and the video footage. Finally, this begs the question “why have zoos anymore?” They are outdated and cruel. This should never have happened, we shouldn’t go to see animals in cages. If we want to educate our children and grandchildren there are so many other ways. Take them on a safari, buy them books, let them watch the discovery channel, go on nature walks with them, take them to animal sanctuaries, but please stop going to zoos! RIP sweet Harambe. I know you were protecting and you didn’t deserve to die. Previous Post Apology to Spare? What a beautiful tribute to such a reflection of how our culture has become. Thank you, it was all so avoidable. Oh how sad for this wonderful creature to die!!! I am appalled and saddened at the senseless death of magnificent Harambe. If the mother had been carefully watching her child, and the enclosure had been better built, maybe this gorilla would be alive today. Some people are idiots. I think the family of this child should be made to pay for the loss and replacement of Harambe. I believe more will come to light as the internet sleuths dig into this mother. It was totally avoidable. Sad for all living things kept in cages to gawked at. End zoos and end this kind of tragedy. Like all things in this world! they happen for a reason! Sometime it is senseless to us! the interaction of a Gorilla with its environment is inevitable! He was both protective and showed great interest in the child! It is just another example of the fear we as people have from these gentle giants! I have yet to see in the jungles the death of a human by a gorilla? have you? I was in Rwanda back in 94-95 and I have seen many of my friends explore and visit the low land Gorilla’s there! the closest thing they got was flatulence from them! Nothing more! even in the wild – they are not aggressive unless threatened! and even then they will show strength rather than use it! all to defend the troops and the family they have! Nothing more nothing less! the administration could have dealt with this situation far better than just automatically shoot to death this majestic male! that was and is to me a piss poor judgemental decision by human’s who don’t understand gorilla’s behavior patterns! Unfortunately it was a decision by human’s who have fear in their hearts and mind! Unjustified! Uncalled for! and THEY should be held accountable (but will not!) – build better enclosures for endangered species! so human’s cannot and will not be able to overcome them for the sensation of being ONE with Nature! – that is the fault of the designers in these appalling places we call a Zoo! Protect the animals! protect the people! Make this a natural environment where they can flourish! and be protected! not hunted like some stupid animal that is what we do in the wild! not in civilization where we show care – responsiveness and love for the animals we enclose in there! Enough said! Let us hope that his will wake someone up the chain of command at these places to rethink and redesign these animal enclosures to protect them and us!